Retrospace: Bad Songs #2: "Love Is All Around" by Sammy Davis, Jr.
Bad Songs #2: "Love Is All Around" by Sammy Davis, Jr. This is the Sammy Davis, Jr. I remember, not the serious vocalist, but the hep cat from the 1970's with the Nehru jacket and plenty of bling who brought down the house when he was a guest on a variety show. Sammy recorded a lot of crazy stuff in the 70's when he went to MGM records - some good, some bad.... real bad. 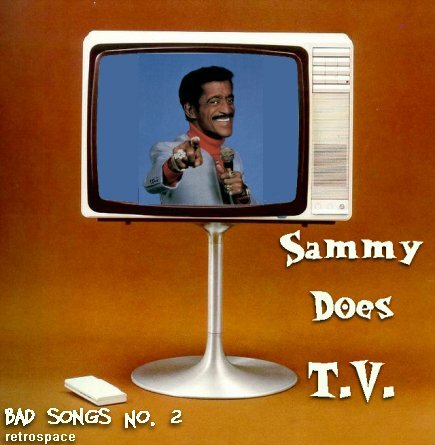 Here's a couple examples of the bad - Sammy Davis, Jr. kickin' it primetime with TV theme songs. Sammy could sing the Declaration of Independence and it would sound groovy and swingin' - so, I don't want to knock these songs too much. They probably fall into the so bad it's good category, or so dire it's amusing. Take your pick. I love the Mary Tyler Moore theme song, the Hawaii 5-0 theme song, and Sammy Davis, Jr. However, I also love baked beans, tuna fish and vanilla ice cream, but that doesn't mean they go good together. Cheers! Man the 70's, so messed up..probably why i was such a messed up teen in the 70's. What the hell was Sammy singing show themes for? What album is this? Why Sammy? WHY??? Love it! I just tweeted this link. Sammy did a lot of hard drugs in the 70's. This sort of thing happens. Indeed. I'm a huge fan. To me it Sammy Davis Jr. is one singer who could sing the dictionary and it would sound good. Didn't know Hawaii 50 had words to it. I always thought that some pop singer in the 70's could have had a hit with the MTM theme. Not too surprising he sang these themes. After all he sang the theme to Baretta on the TV show. OH MY WORD! The Hawaii 5-0 thing is so bad I couldn't listen to more than 15 seconds! The 'Hawaii 5-0' theme had lyrics...who knew? Sammy pulls it off well. Just be thankful it's not Jack Lord singing. Sammy's version of the MTM theme doesn't hold up against Husker Du's..
Is it wrong to like these? Hell, it's better than any album Leonard Nimoy put out. I must have this album, another musical masterpiece to sit acompany my wWilliam shatner albums on my record shelf.